Our first stop will be Paliani Convent which is 280m above sea level, next to the village of Venerato and 20km north of Heraklion at the exit of Venerato Gorge. The monastery is dedicated to the Assumption and its feast day is August 15. Paliani Convent is considered to be one of the oldest monasteries in Crete, but the exact date when it was founded is unknown. Leaving Paliani and heading south, we arrive at Gortys, also known as Gortyn or Gortyna, one of the most important ancient cities in Crete with an unbroken history of 6,000 years. Gortys is one of the most extensive archaeological sites in Greece. 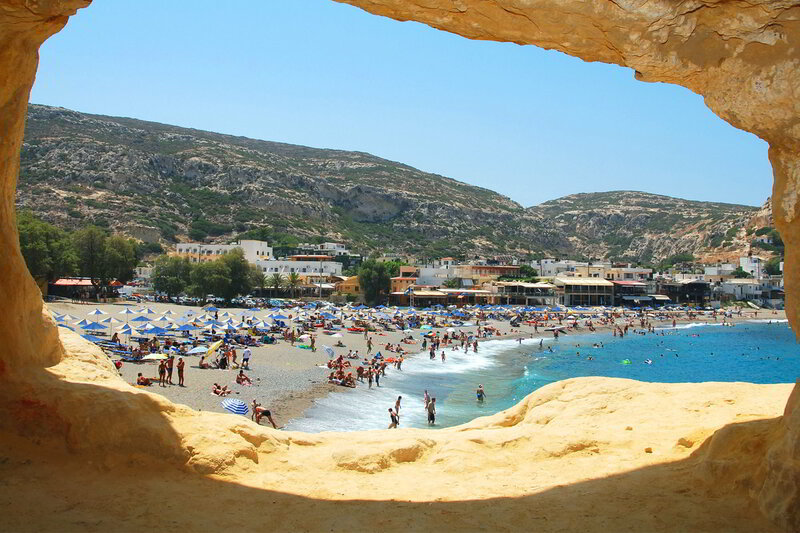 The well known resort of Matala will be our stop for lunch. Here you will have a chance to sunbathe and swim on the glorious beach surrounded by the famous caves where the hippies used to live in the 60’s. Our last stop at the Monastery of Panagia Kaliviani. It dates back to the 2nd Byzantine period, and is dedicated to the Virgin Mary, since an old small icon of the Annunciation of the Holy Mother, was miraculously found there (the icon can be found today in the new chapel). The monastery also houses a girls' orphanage established in 1958. A day that combines history, culture, religion and relaxation.